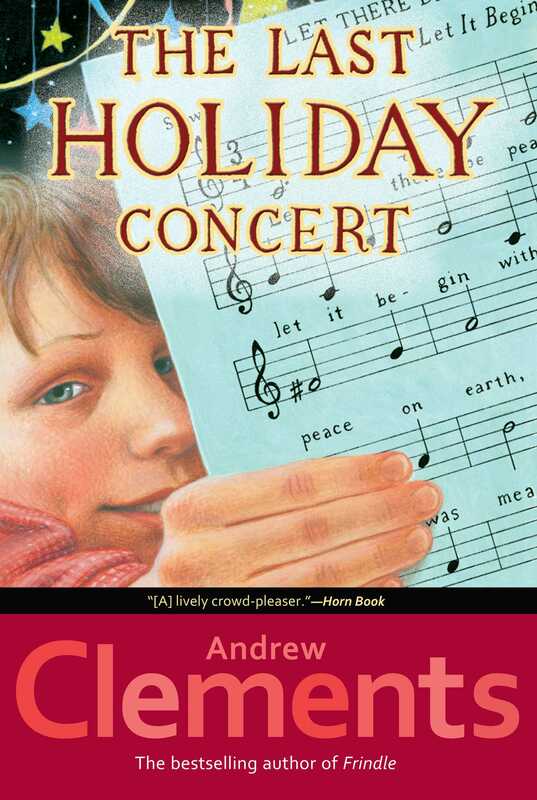 A moving holiday story from New York Times bestselling author Andrew Clements. The Last Holiday Concert About the Book Just because he is popular doesn’t mean sixth-grader Hart Evans has all the answers. He doesn’t know how to get his little sister Sarah off his back. And he doesn’t know how to make Mr. Meinert’s chorus class any less aggravating. Or maybe he does. One boring afternoon Hart snaps a rubber band toward his teacher’s podium with an astonishing result. Struggling to control the class and about to be laid off, Mr. Meinert is in no mood to have his worth challenged by a student prank. So he simply stops rehearsing for the upcoming holiday concert. The class elects an unwilling Hart as their new director. Unlike Mr. Meinert and his iron fist, Hart manages the class with loose, friendly charm and encourages everyone’s input. But as the show date approaches, it becomes clear that the concert is chaos. When Hart tries to take tighter control, selecting which kids’ acts to include and which to leave out, his popularity plummets. Distressed by his loss of friends yet not willing to put on a mediocre show, Hart turns to Mr. Meinert. The incredible concert that finally comes to the stage incorporates the Hart-generated frenzy of ideas around Mr. Meinert’s structured theme. They call it Winterhope. But will it be the last holiday concert of them all? Discussion Topics 1. At the beginning of the story, do you like Hart Evans? Do you think he would be a popular kid at your school? Explain your answers. 2. Why doesn’t Hart like chorus? What reasons might Mr. Meinert give for being afraid to lose control of his classroom? Do you think there is a relationship between these two problems? 3. Do you think the punishment Principal Richards gives Hart for shooting rubber bands is appropriate? How does Hart tell his parents about his punishment? What do these events teach readers about Hart? 4. Why is Mr. Meinert going to lose his job after the holidays? What does his wife, Lucy, think he should do about the situation? How does Mr. Meinert feel about Lucy’s opinion? 5. What happens to the chorus after Mr. Meinert announces that he will no longer be in charge of the holiday concert? What is Hart’s reaction to the chorus’s election of him as the new director? What might you have done in the same situation? 6. What do you think Mr. Meinert expects will happen after he gives up control of the chorus? Are his expectations fulfilled? Explain your answer. 7. How does Hart shift from being one of the most popular kids in school to one of the least popular? What happens when Hart finally gets to ride in his father’s new sports car? 8. At first Hart, as chorus director, encourages his classmates to “think big, think free, think bold.” As the concert date approaches, why does Hart begin to reconsider this approach? Was his approach wrong in the first place? 9. Hart feels that his problem with the chorus is “human nature itself.” He divides the class into three types of people: “the doers, the floaters, and the gofers.” How does Hart define each type of kid? Do his definitions apply to the kids you know? 10. In the end, how is the problem of the out-of-control concert really solved and by whom? Explain the satisfactions and dissatisfactions the students and Mr. Meinert probably have with the result. How would you have felt to be part of such a concert? 11. Might there be more than one reason this novel is entitled The Last Holiday Concert? Explain. List three things Mr. Meinert learns about teaching and students. List three things Hart learns about popularity and leadership. Activities and Research 1. Popularity is an important issue for many kids. What does being popular mean to you? List ten or more words or phrases that come to mind when you think about popularity. Then create a survey asking friends or classmates to rank popularity, good grades, athletic ability, artistic talent, teachers’ approval, and parents’ approval in order of importance. Add any other questions you would like. Collect the (anonymous) surveys and create a chart displaying the results. What do the results teach you? 2. To express their concerns about war, the kids in Mr. Meinert’s chorus make up their own lyrics to “Jingle Bells.” Select a theme of interest or concern to you. Write your own lyrics to “Jingle Bells,” or another familiar song, in which you explore your theme. 3. Write a two to three paragraph essay describing the best teacher you ever had. What was special about his or her classroom and teaching style? What was the most important thing you learned from this teacher? How does having a good teacher make you feel or behave? (Note: Unless you want to, you do not have to give the teacher’s name.) 4. Imagine you are Hart’s sister Sarah, his friend Zach, or his friend Alex. Write two journal entries, describing how you feel about Hart at the beginning of the story and after the concert. Then write two paragraphs describing how you think Hart felt about himself at these two points in the novel. 5. Even good kids act up sometimes. Imagine you are writing a script for a television comedy or drama entitled “The Day I Misbehaved.” Choose one scene to write, such as the moment you got caught, telling your parents, serving out your punishment, or telling someone what you learned. Read the finished scene aloud with friends or classmates. 6. Many of the kids in the chorus offer Hart suggestions about things they could do in the concert. If you were in Hart’s class, what special talent or trick might you have offered? Write a paragraph describing your talent, adding a photograph, sketch, or diagram if desired. Combine your paragraph with those of friends or classmates to create a wall display entitled “Our Many Talents.” 7. Like Mr. Meinert, does your life outside of school affect your school performance? Keep a week-long journal. Each morning, write a paragraph noting your feelings, thoughts, plans, or concerns. After school, write down observations or recollections about the day. Did you do well on a test? Get into an argument? Receive a compliment? After the week reread your journal. Are there any connections between your home life and school life? Discuss your observations with a friend or classmate. 8. With a group of friends or classmates, plan a performance of your own, perhaps for a younger class or for your family. What theme might you choose? What songs, acts, costumes, sets, or other elements will you include? How will you organize and direct rehearsals? Ask an adult to help oversee your rehearsals. After the show, discuss your experience of planning and performing the show. 9. 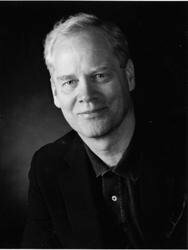 What does Andrew Clements mean at the end of chapter eight, when he writes: “ . . . no one knew Hart Evans as well as they thought they did—including Hart Evans himself”? Have you ever surprised yourself with a skill or talent you did not realize you had? Draw a series of cartoon-style panels depicting this experience. 10. Are the arts important to you and your friends? Write a letter to your school or community newspaper explaining why the arts are important to kids or write a letter of support to a local artist or arts organization, such as a theater or orchestra. Participate in the arts yourself by taking a class, attending a performance, or being in a show yourself! This reading group guide has been provided by Simon & Schuster Children’s Publishing for classroom, library, and reading group use. It may be reproduced in its entirety or excerpted for these purposes. "Clements is a master at taking elements of relatively common school situations and turning them into masterful stories with truly engaging characters....[’ÄäThis story] will leave youngsters teeming with emotion."